This entire project, I have been unsure what to do about bulk. I mean the bulk that happens when a fluffy interlining gets sewn into seam allowances. 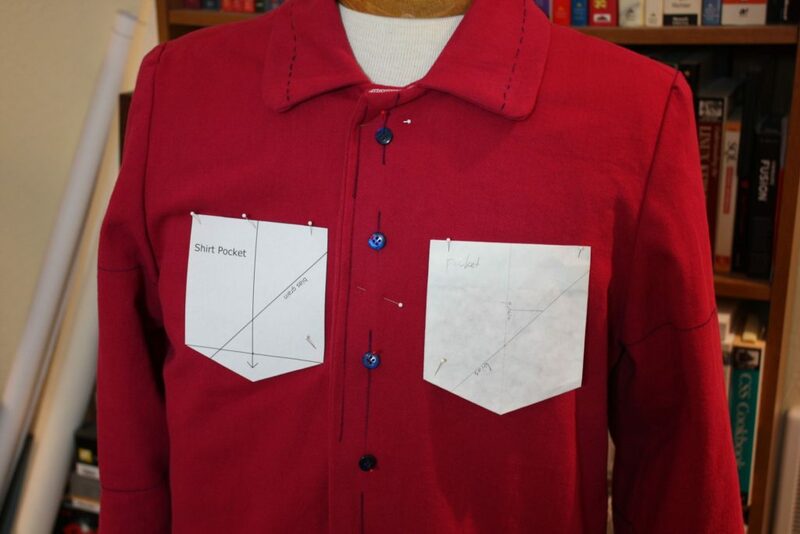 For the final shacket, I still plan to attach the interlining to the lining piece, and treat them as one. To deal with bulk in the seam allowances, I tried out a technique I found in Kenneth D. King’s book, Cool Tricks. 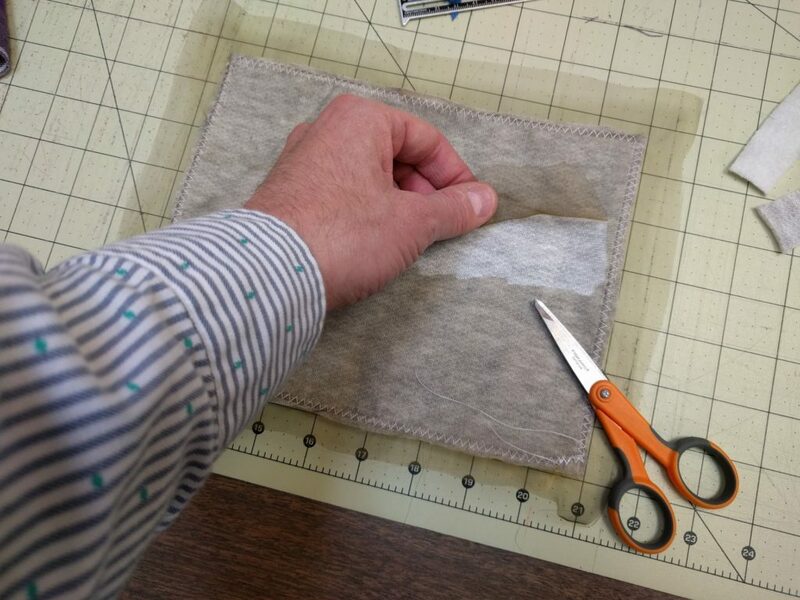 You get a piece of “thin cheap” fabric, and cut it to the same shape as the bulky interfacing/interlining. Next, attach the two pieces with a zigzag stitch, using a wider seam allowance than you will use for the seams. (In the book, King uses a 1 inch seam allowance). 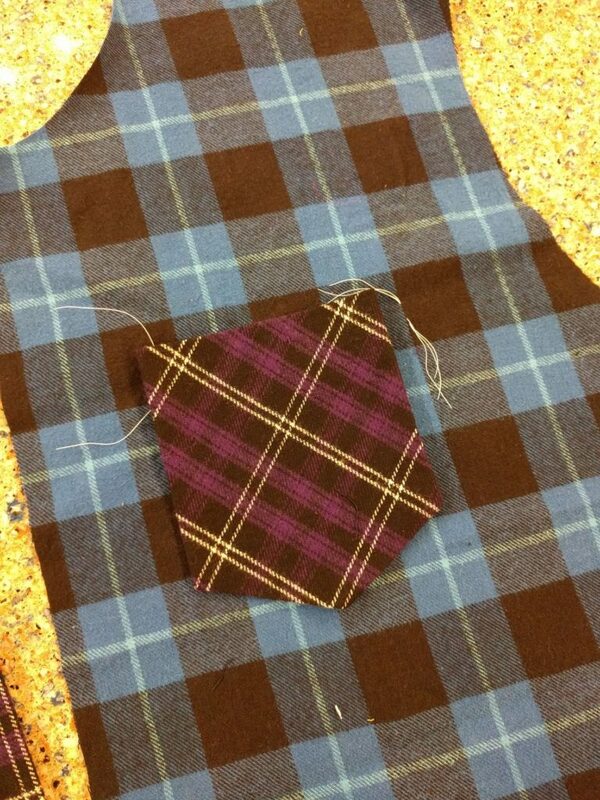 Then, cut out the “thin cheap” fabric in the interior of the piece, up to the seam allowance. Then, trim the interfacing out of the seam allowance, and baste the “thin cheap” fabric to the fashion fabric. Finally, sew your construction seam. 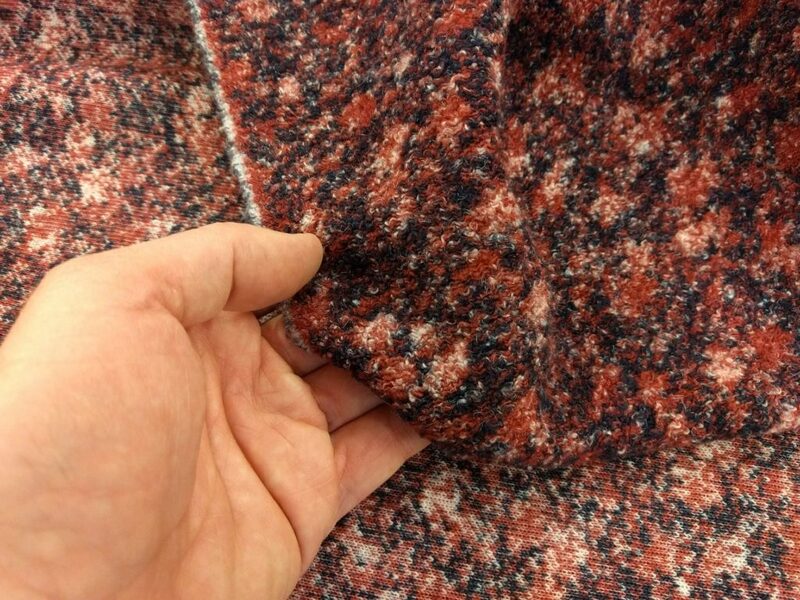 The “thin cheap” fabric is caught in the construction seam, but not the thicker interlining. I made a sample using some organza as “thin cheap”, some scrap sweatshirt fleece as the interlining, and flannel for the public-facing fabric. (At the time I made the sample, I was toying with the idea of attaching the interlining to the outer flannel, an idea I’ve since discarded). This seemed to work pretty well, so for the actual shacket I plan to attach interlining to the lining piece with this method. For the interlining, I started with some JoAnn’s fleece, then stumbled upon some technical outerwear fabric that is both thinner and water-resistant. I thought it was a good idea. Tammy, the studio owner at Sips N Sews, took one look at my technical outerwear fabric and immediately tried to talk me out of using it. First, it is better used for a garment all by itself – for instance, a pair of ski pants. Second, the water-resistant aspect won’t work well. 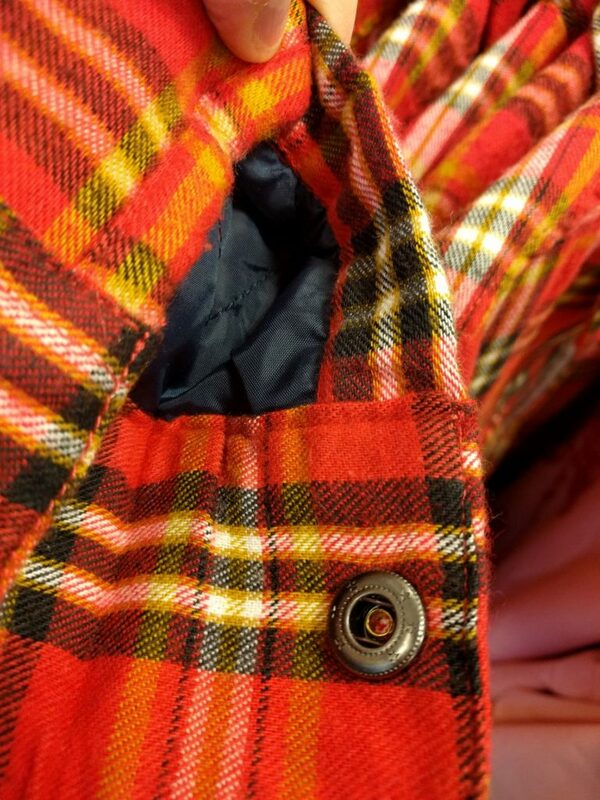 Since the outer shell of the shacket would be cotton flannel, it would absorb the water and then transport it to the seams, where it would leak to the inside. 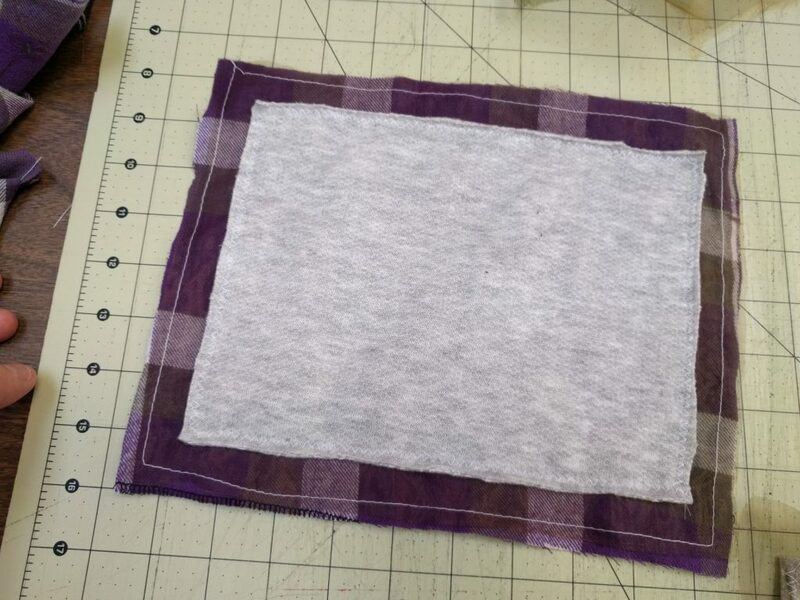 Instead, she suggested the perfect alternative: a cut of poly-cotton (70/30) sweater knit fabric that had been sitting in the studio free-fabric bin waiting for the right project. It’s just fluffy enough to provide the right amount of insulation, and the fact it is a knit means it will afford movement sandwiched between lining and the outer shell. It’s kind of ugly, but it doesn’t matter since it will be fully enclosed and not visible in the finished garment. I’m really thrilled about this fabric, and I think it will work well. It’s finally time to talk about cuffs. I want a shirt-style cuff, and I liked the cuff with the extension tab I saw in the store, so I’m making mine like that too. 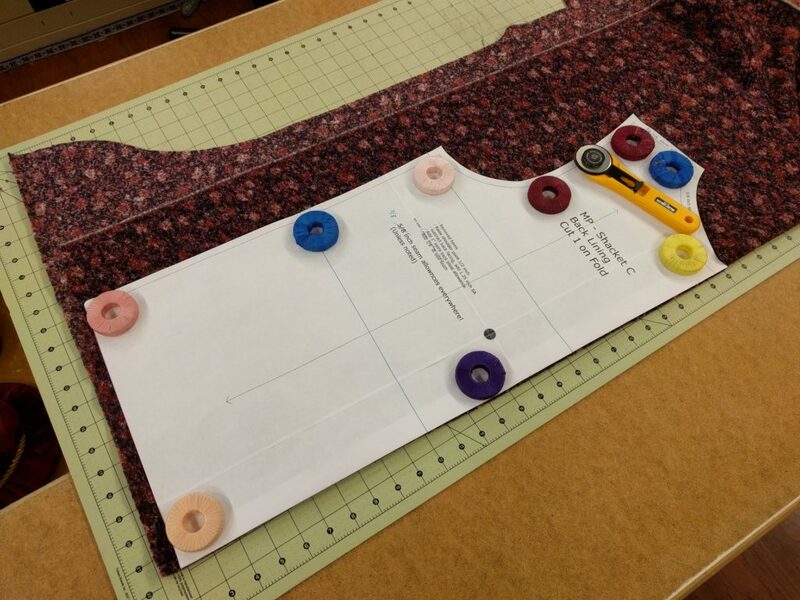 The challenge has been how to make a lined garment with cuffs. It seems simple enough to make the outer sleeve and the lining the same length, and then to sew the outer sleeve plus lining as one unit into the cuff, so they both get caught by the cuff seam. But a shirt-style cuff also has a slit running up the back, that is finished with a placket. How do I do that with a lining? One option came from the sample photos I took at the store. An extra seam is added to the sleeve. That sleeve is flat-felled from the shoulder up to the end of the cuff opening. There, the lining seam allowance is stitched to the outer fabric from the inside. Turn it all right-side out, and the cuff opening is finished with the lining. A bar tack at the cuff opening anchors everything. I tried making a quick sample, again to convince myself the construction steps would work. They did. But another option presented itself on another espionage run to the mall. I spotted a different shirt jacket with a lining, cuffs, and a fairly standard placket to finish the opening. I haven’t made a sample yet, but likely will make one before final construction just to be sure there aren’t any “gotchas” with an interlining and lining involved. I plan to use some form of continuous lap placket, rather than the traditional “tower” placket seen in a fine dress shirt. 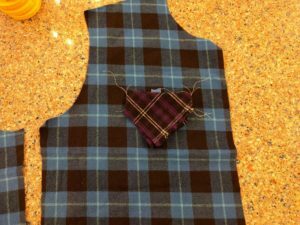 I have completely eliminated the lower pockets from the design. I agree with MainelyDad’s comments; the lower pockets read blazer or sportcoat rather than shirt. So I am going with chest pockets. 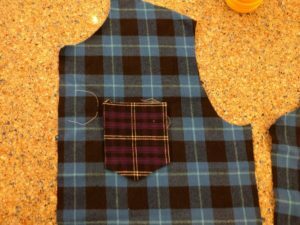 I’m using a contrast flannel as an accent fabric for the pockets. 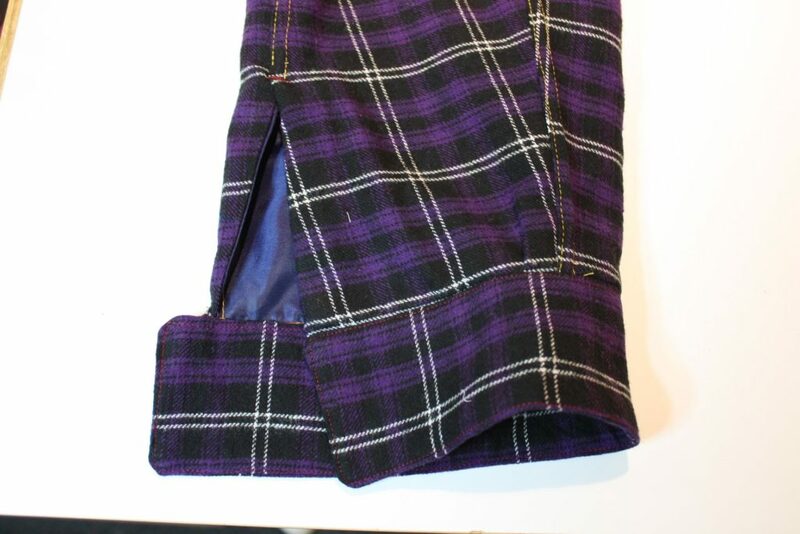 I don’t have enough of the blue plaid flannel to go around, so I’m using the purple accent fabric for facings, inside cuffs, the undercollar and probably the sleeve plackets. I did a bakeoff of pocket treatments, and settled on a bias cut for the pocket because it had the most visual interest. 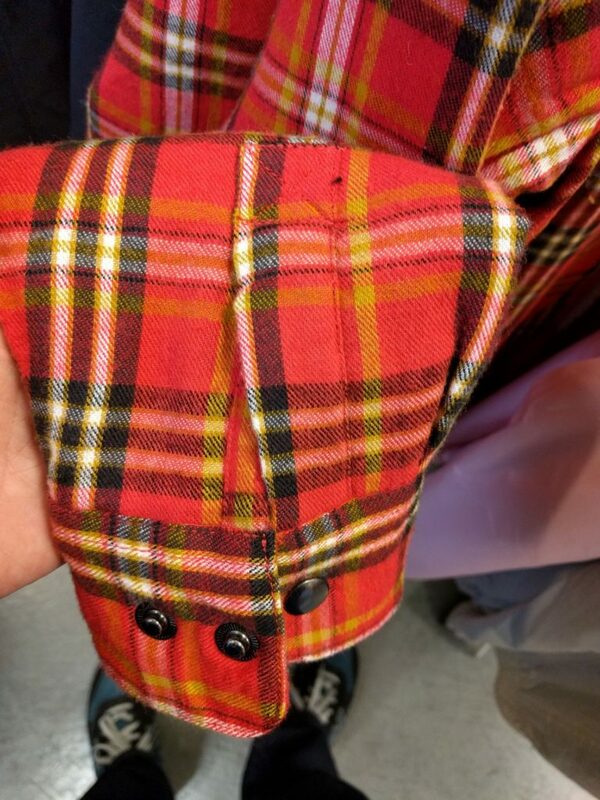 The pocket has a matching flap. And in agreement with some critique I received at the studio, I am making one chest pocket rather than two. With the accent fabric, two pockets would be a little ostentatious. Currently, I’ve cut all of the fabric pieces, and I’m ready to start constructing the outer and lining shells. More progress to report soon. I have enrolled in a class in Fashion Draping at City College of San Francisco for the spring semester. 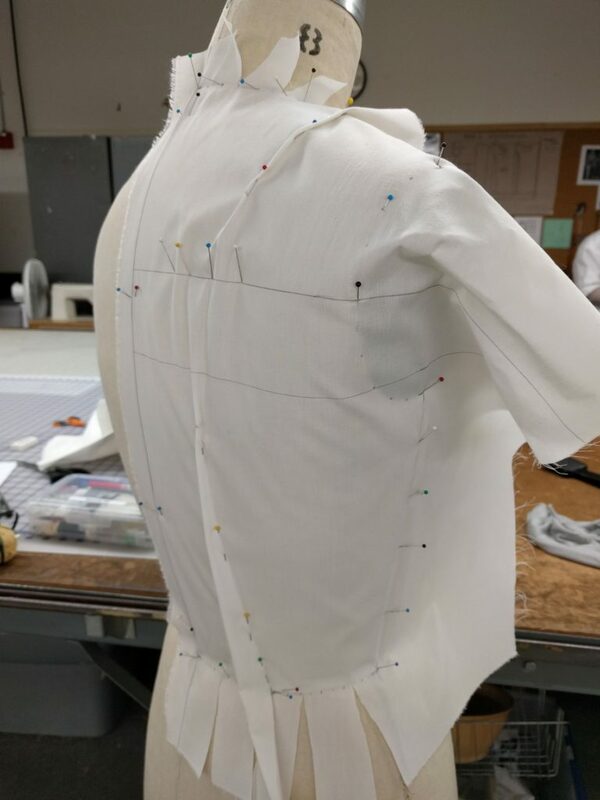 Draping is the technique for creating sewing patterns from scratch, by molding and shaping fabric to a form, or to a live model. The course covers much of the same material as a class I took with Paul Gallo at Sips N Sews a year ago. But since this is a full semester course, there is much more time and much more material to cover. My instructor is Judy Jackson. She works professsionally in theater costuming, and she is also a Craftsy class instructor. I have previously viewed her Craftsy class Patternmaking for Knits: Essential Slopers and I like her teaching style. I’ve been to two class sessions so far. We’ve covered draping a basic bodice sloper, both front and back, on a dress form. This coming week, we will drape a skirt sloper. Each class begins with a demonstration and lecture, followed by a lunch break and then a lab session where we carry out the same work on dress forms in the classroom. Here’s a photo of the drape I did in class, for the back of my bodice sloper. The first day, we each chose a dress form we will work with for the remainder of the semester. Mine is a size 8 Wolf form, which is very similar to the form I have at home. While I won’t be using my home form for the class assignments, I can use it for practice outside of class. The classroom is also equipped with industrial sewing machines and irons. I got my first experience using an industrial iron, and while I’m not yet ready to ditch my domestic Black and Decker, I can say they are quite nice to use! More on the class in future articles.